Comments: Has moderate shelf and/or corner wear. Great used condition. A portion of your purchase of this book will be donated to non-profit organizations. Over 1,000,000 satisfied customers since 1997! We ship daily M-F. Choose expedited shipping (if available) for much faster delivery. Delivery confirmation on all US orders. 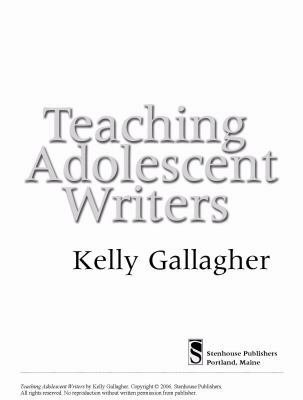 Kelly Gallagher is a full-time English teacher at Magnolia High School in Anaheim, California.Gallagher, Kelly is the author of 'Teaching Adolescent Writers ', published 2006 under ISBN 9781571104229 and ISBN 1571104224. Loading marketplace prices 17 copies from $4.89 How does the rental process work?